Exeter Arms, Exeter Place, DE1 2EU – Traditional real ale with a Modern British menu with a global twist. The Brunswick Inn, 1 Railway Terrace, DE1 2RU – Railway Terrace tavern with traditional decor and serving local beer and British pub food, and is right by the train station so is easy to find for fans travelling by train. Note: we’ve heard recently that this pub has stopped serving away fans in colours. After a disappointing end to the full season, we must again aim to navigate through the minefield that is the Championship playoffs. This time our opponents are the Rams, who successfully turned on some good late form to avoid calamitously dropping out of the top 6. In what’s sure to be a closely fought encounter, what should we look out for as we aim to take a successful result back with us to the Cottage? In the 4th of our self proclaimed “big 6” matches in March, we travelled to Pride Park full of confidence, having dispatched both Aston Villa and Wolves in previous weeks. We knew that a positive result would see us leaprfrog the Rams up to 4th place, and strengthen our promotion ambitions. After Weimann put the ball into the net from an offside position, early goals from Sess and Mitro provided an early 2-0 lead. Both goals were great examples of our strikers predatory instincts – reacting quickly inside the box to tuck the ball away. However, a well placed long shot from Huddlestone (not for the first time against us!) provided Derby with a route back into the game, and they rallied. It took some great defensive steel, and some excellent reflex saves from Betts, to hold on under pressure, and the Whites fans travelled home from Pride park with the 3 points. How will Derby set up? It looks like a shakeup in Derby system has proved to be the catalyst to turning their poor form upside down. Whilst the league’s golden boot winner (Matej Vydra) has dropped to the bench, the new system suits their squad well. In particular, their 3-man strikeforce have stepped up and put great recent performances in. Playing against opposition in Barnsley on the final day, who were desperate for the win to guarantee their own safety, and dispatching them 4-1 was a great result whatever angle you look at it. One of the main benefits of their new system is the extra freedom it has given the wider forwards. Lawrence and Weimann on the flanks are now supported by overlapping wingbacks, especially Wisdom, meaning they can place themselves in much more dangerous attacking positions. The front 3 have been thriving on throughballs, using their pace and strong dribbling ability to cause havoc for opposition defenders. It’s a direct style of play, but still fairly attractive, and has created plenty of chances against some of the best defences in the league. On the flip side, the gap the formation leaves is the 2 man central midfield, which can often get overrun on the break. Huddlestone and Bradley Johnson are both in the twilights of their career, and don’t have the ability to defensively cover all of the pitch. This is therefore the clear area to target on the break, especially away from home. As Matej Vydra has dropped to the bench, Cameron Jerome has stepped up to the plate and become the clear focal point of the Derby attack. The Englishman has been a Fulham transfer target multiple times, and it’s easy to see why. Despite being in his early 30s, he still has a great physical game: he’s strong, good in the air and still has the ability to out-pace central defenders (see below). He’s in cracking form, scoring crucial goals to help Derby cling onto 6th place. He’s got 4 goals and an assist in his last 3 games, so he’s on red hot form and will be full of confidence. A lot has recently been made by Whites fans about how this side ‘bottles it’ whenever the pressure is on. To me, this is nonsense. Plenty of times this season, we’ve gone into “must win” games (most recently Sunderland at home), and found a way to get the 3 points. Slav shouldn’t, and can’t, let the players heads drop after a single poor performance after 23 brilliant ones. We should rightfully going to this game in a positive mindset, feeling confident we can make it to Wembley. Derby will provide a stern test, and certainly look a different team to the one who collapsed so dramatically from 2nd place. The new setup gives attacking players freedom, and we’ll need to be prepared to deal with the pace of the attack. After Birmingham, some players clearly need to step up their game. Against a 2 man midfield, this is the perfect opportunity for Cairney to right some wrongs and command his team to dominate the centre of the pitch. I’d also love to see Sess and a more dynamic right winger run straight at the 3 man defence – none of whom are blessed for pace. 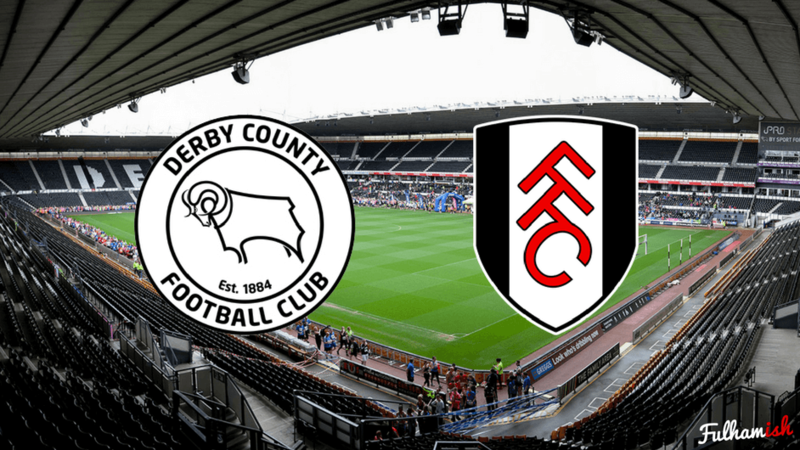 Let’s get behind the boys, and help them bring back a good result to the Cottage!